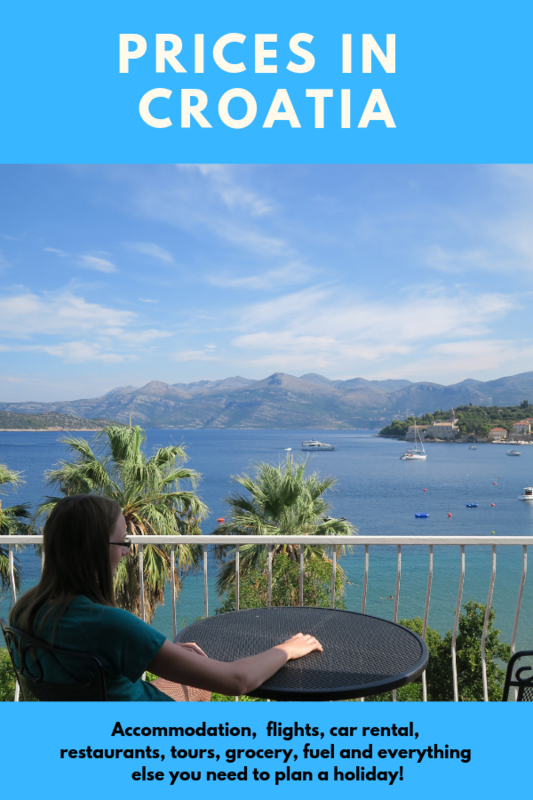 Prices in Croatia | Travel Hacker Girl - A blog for travellers. How expensive is Croatia? It is normal, that you want to know the prices in Croatia before you plan a holiday there. We spent 16 days in the country and took notes of all our expenses. 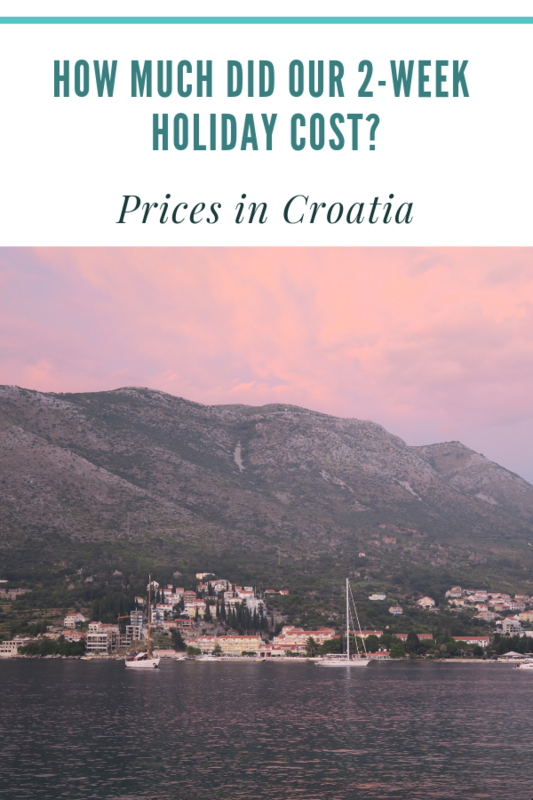 In this post, you will see some examples of current prices in Croatia and you will learn how much we spent on our trip. In my childhood, Croatia was considered a cheap holiday destination from Hungary. People could drive there easily in a few hours and have a nice beach holiday with affordable prices. However, Croatia became a really cool and popular destination in recent years, thanks to filming many scenes of Game of Thrones in Dubrovnik and Split. This made Croatia more expensive and certain parts of it experience overtourism. This was our biggest expense, which made me realize again how amazing home exchange is, as it allows us to have free accommodation. We used Airbnb during our 2-week holiday in Croatia. We stayed at 7 different places. All of them were clean but small and simple: a double bed, bathroom and 5 of the places came with a small kitchen. We paid a total of £760 for 15 nights. That averages £50 for a night for two, which isn’t that bad. We booked a car through Vehicle Rent, which used the car hire company Carwiz. We had extra insurance through Vehicle Rent but didn’t need to use it luckily. We hired a simple Volkswagen Polo for 8 days and paid £225. I read some horrible reviews about Carwiz before our trip, so I was nervous, but there was no issue at all picking up or returning the vehicle. 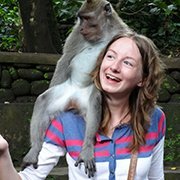 As a nanny my holiday dates are not flexible, so we couldn’t go for cheaper flights based on dates. We flew in high season, so our flight from London turned out to be quite pricey, even though we booked them 7 months ahead. The two of us paid £410 for a return flight to Dubrovnik with two checked in luggage. There are ways to find cheaper flights if you have some flexibility regarding dates. Restaurant prices in Croatia were surprisingly not any cheaper than in London. During our first week in Croatia, we had access to a kitchen and we cooked for ourselves. The second week we didn’t have a kitchen, so we ate out at restaurants. A meal out for the two of us with a glass of soft drink (no alcohol) cost us £23 – £52. We ate out in restaurants on 12 occasions (twice inside the walls of Dubrovnik and 10 times on the Elaphiti Islands). In addition, we occasionally bought ice cream or pancake at the beach. Eating out cost £450, which was our second biggest expense on our trip! 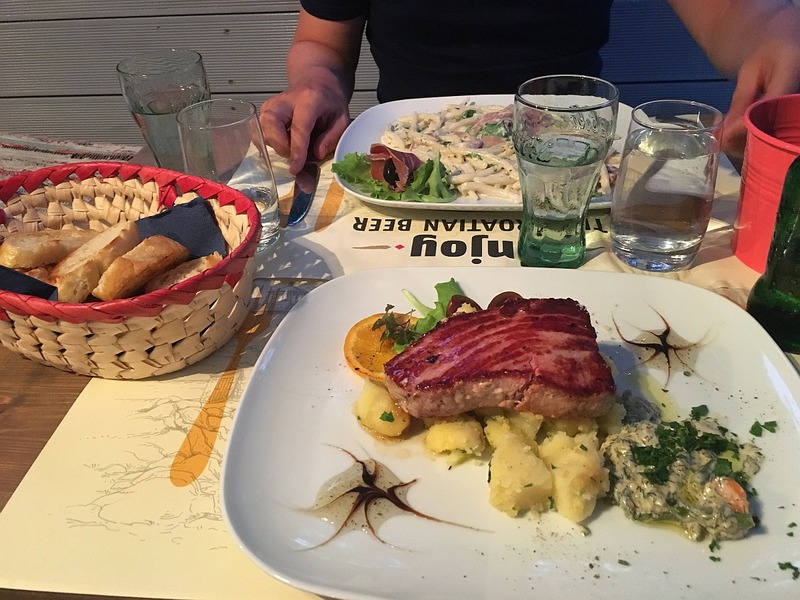 It made me realize how expensive eating out is, and reminded me to cook more on future trips! Our first week we cooked our own food or made packed lunches if we were out. The second week we mostly ate out for lunch and dinner. We bought our own breakfast every day during the 2-week holiday. We spent £130 grocery shopping during our time in Croatia. We took part in a lot of tours in Croatia. I will list the price for them, as this is what normal people would have to pay, however we had a lot of these trips sponsored, which means we didn’t have to pay. We went on a full day catamaran trip with Summer Blues. The tour included food and beverages, a catamaran trip to the island of Brac, bus journey to the top of Vidova Gora and then transfer to have a swim at the famous Golden Horn Beach. We also had two swim stops at hidden bays before we headed back to Split. This full-day trip costs £150 for two, but this was a sponsored trip for us. 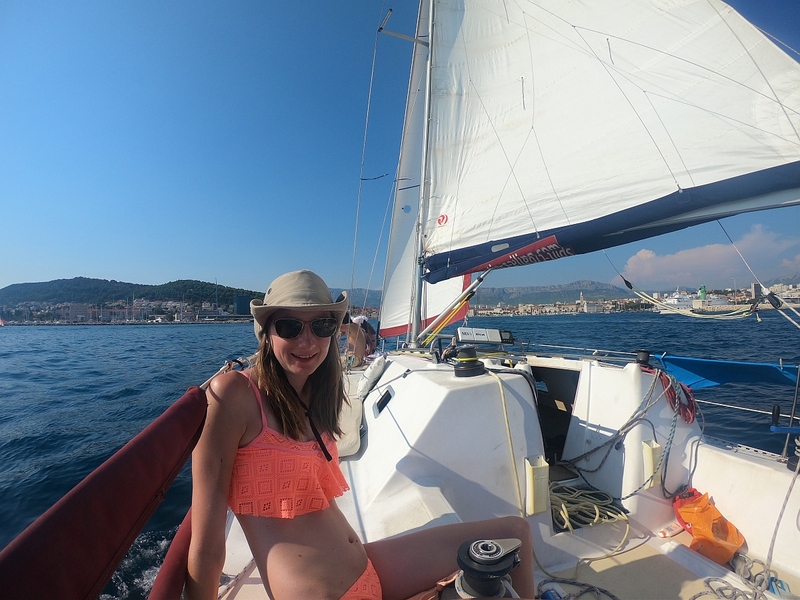 We went on a sailing trip with Opcija Tours. The destination of the trip is always different based on the conditions. We visited a lovely seaside town at the island of Solta and then had a tasty Dalmatian lunch (provided) on board at a wild bay off the coast of Brac. We finished the day by going for a swim, before sailing back to Split. Amazing full day adventure. The boat normally has a maximum of 8 guests. This trip costs £205 for two people, but this was a sponsored trip for us. During this 3-hour adventure, you can zip line down 8 wires. 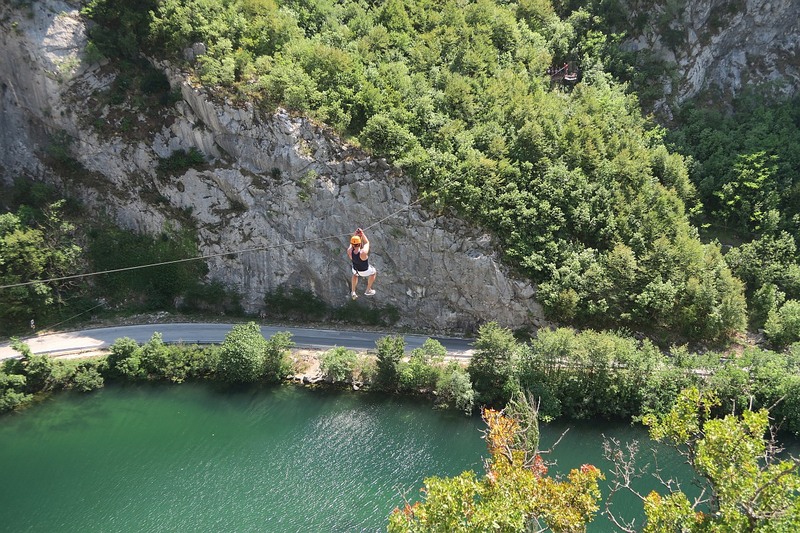 Each of them offers great views to the Cetina River below you. This experience costs £97 for two (800 kuna), but this was a sponsored trip for us. 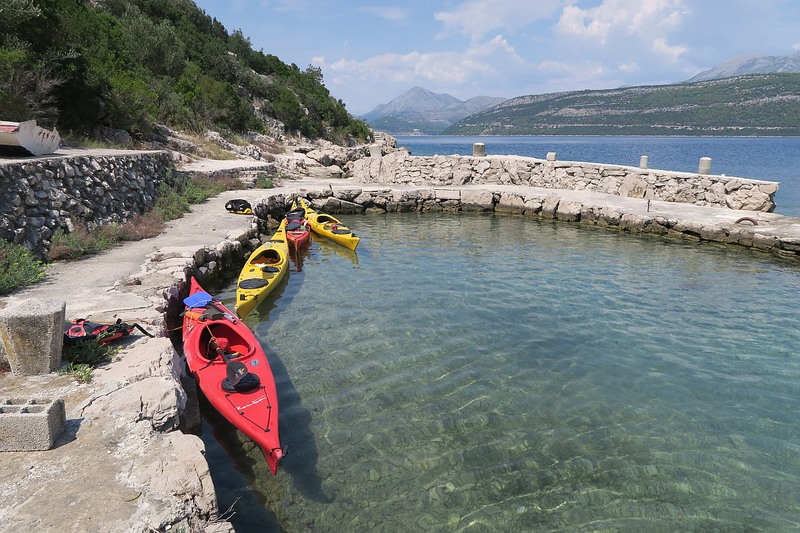 We chose a more expensive company Dalmatia Getaway, as they provide a trip when the river is the quietest, so we could have it all to ourselves. 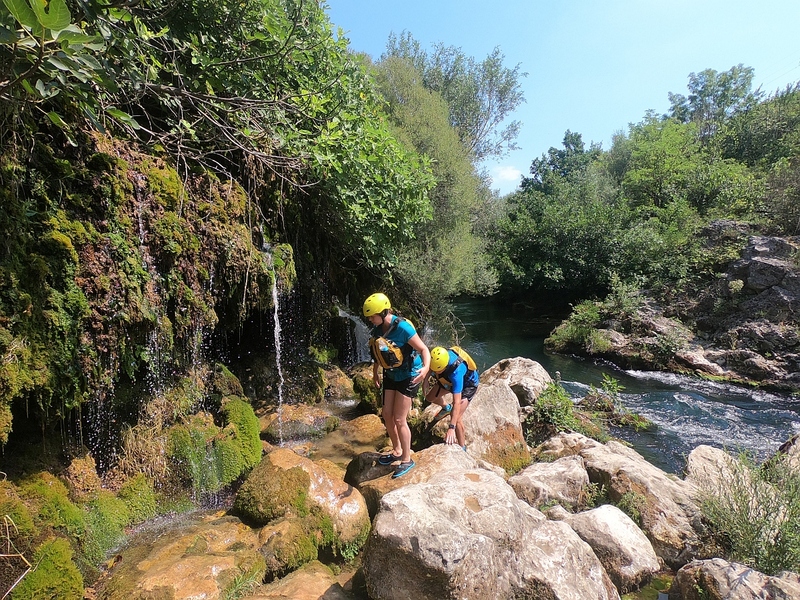 They also incorporate some canyoning elements into the rafting trip, making it more fun. We could rope swing into the water, explore a hidden cave behind a waterfall and go cliff jumping. This 5-6 hour experience costs £97 (800 kuna) for the two. The company also provides an awesome video, that they edit about the trip. 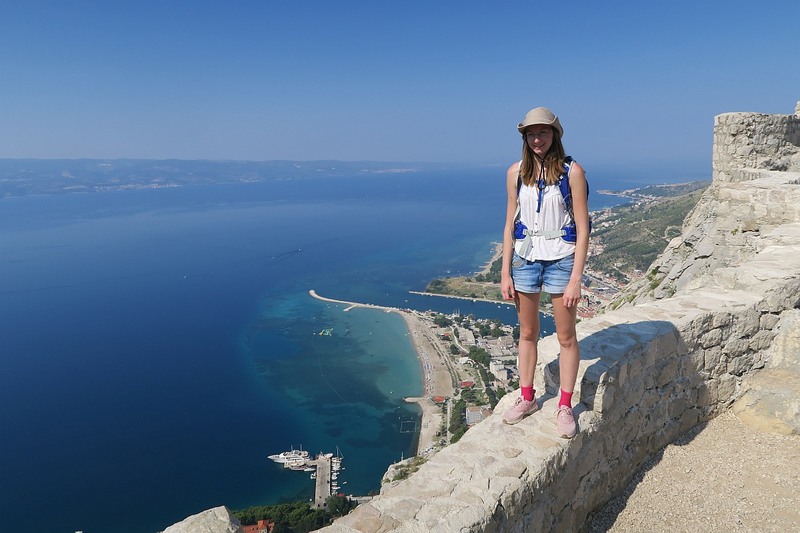 It is well worth hiking up to Starigrad Fortress, as you will have gorgeous views of the town. Entrance fee is £3.6 (30 kuna) for two people. 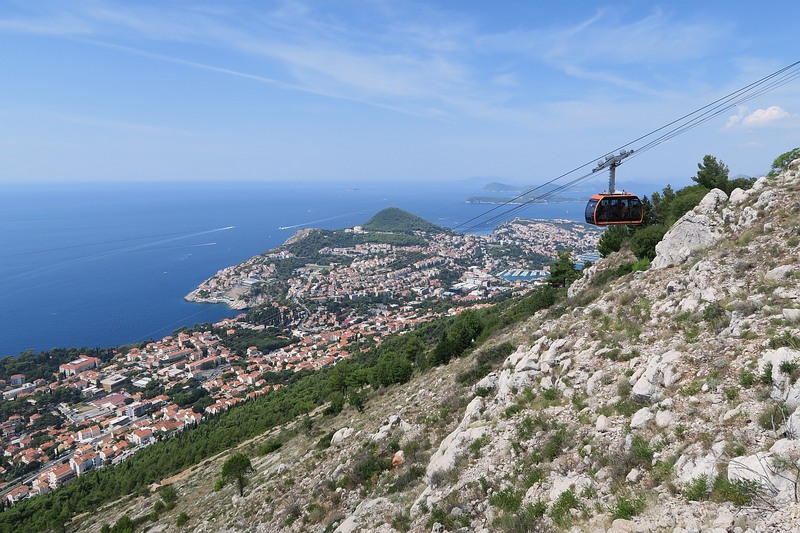 The city walls and cable car in Dubrovnik are both worth a visit. 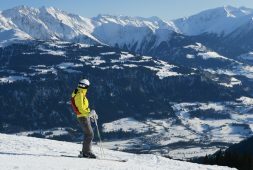 They cost the same and offer lovely views, but the two is a very different experience. 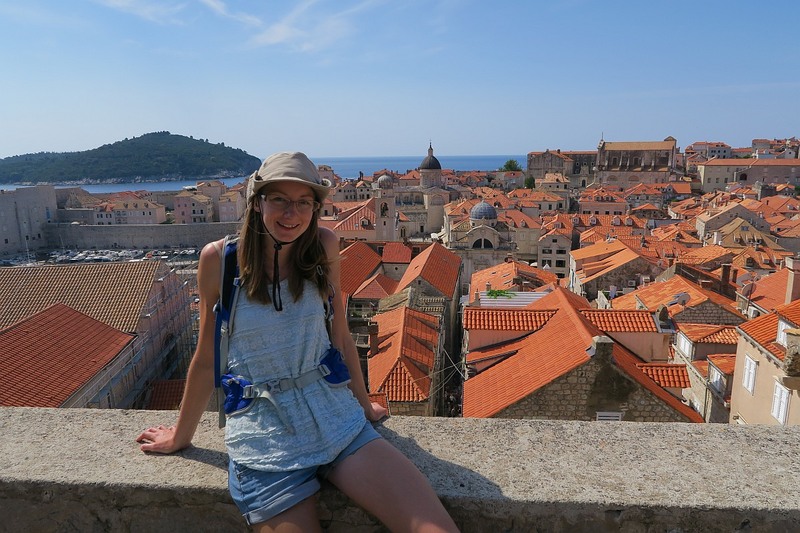 Visiting the City Walls is a great way to see the details of Dubrovnik. It takes about 1,5 hours to walk around the walls. We paid £36 (300 kuna) for two adults. There is a lovely view of the whole city and nearby islands from the top of Srd mountain. It costs £36 (300 kuna) for two adults to use the cable car. However, if you want to save money you can hike up in 45 minutes for free. If you are into photography it might be interesting for you to visit this place from the inside. The entrance fee was £6 for the two of us. We made the mistake of not taking note of our mileage, so we don’t know the exact distance we drove. 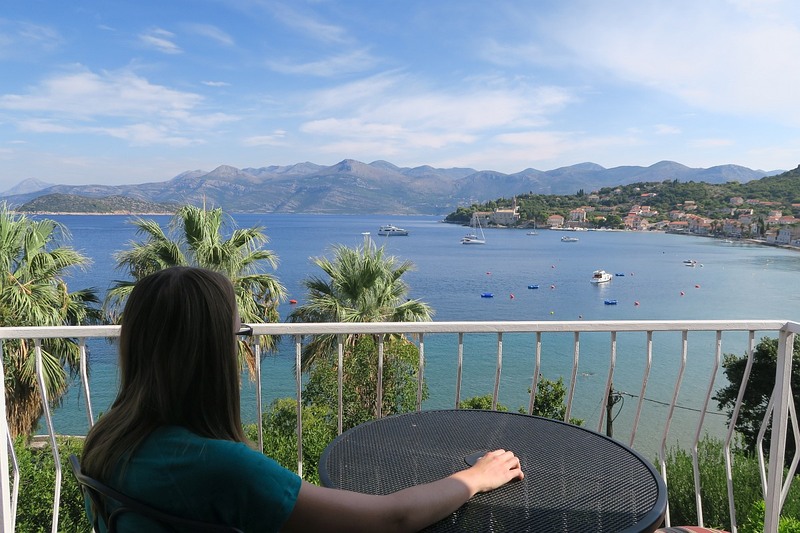 We essentially drove up from Dubrovnik to Split and then back, so we drove under 600 km. We paid £48 for fuel in total. Public transport and parking were cheap in Croatia compared to London. We used the bus in Dubrovnik to get to the city centre from the ferry port and then to get to the airport. We also paid for the ferry journey to the Elaphiti Islands and back. In the city centre of towns like Split, Dubrovnik and Omis you will need to pay for parking. We only paid for parking in Omis during our holiday, as we parked at our accommodation at the rest of the places. We paid £40 in Croatia for transport charges. This is significantly less than what we paid in the UK, even though that only involved an airport transfer. We paid £44 for the train ticket to get to the airport from the city centre and then back. At the end of our holiday we had a late flight and public transport was limited and we had work the next day, so we took a taxi from Liverpool stn to home, which cost £56. Ouch….! This was my first time in an iconic London taxi, so I will think of it as a sort of bucket list experience…. 🙂 We paid a total of £100 for airport transfer in the UK. 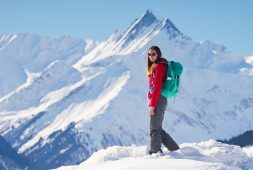 We think travel insurance is very important and if you can’t afford insurance, you can’t afford to travel. We use InsureandGo for our insurance. I can’t say how good they actually are, as luckily I never really needed to get money back from them. Our insurance cost £192 for the two of us for 16 days, which also included kayaking and extra cover for expensive items like camera gear. We spent £36 on small gifts for friends and family: gifts included postcards with stamps, ball, fridge magnet, Croatian sweets and bracelets. This 16-day holiday in Croatia would have cost us £3982. However, we managed to save £1325 thanks to some sponsored trips. So this holiday cost £2657 for the two of us. Having some sponsored tours was a great help for us financially, but don’t forget the amount of work that goes into writing a blog post, creating videos, running social media promotion, etc. You can also arrange a much cheaper or much more expensive holiday in Croatia depending on your needs. In fact, Croatia can be a very budget friendly destination if you are happy to just relax at the beach. 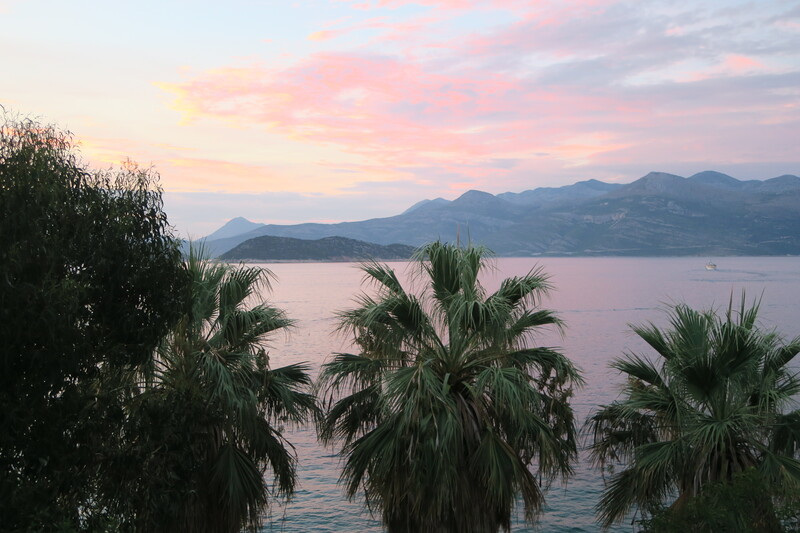 Once you leave Dubrovnik and Split there are several lovely beaches, which has affordable restaurant prices. I found Pisak, Makarska and Cavtat very reasonably priced and they all have lovely beaches. Have you been to Croatia? Did you find it expensive? I’d like to hear what you all think! Croatia looks so beautiful! It’s nice to have an idea of what things will cost for trip planning. Thank you for putting this post together! Croatia is one of my favorite countries!!! Great guide! Just in time since I am planning on going there this year. 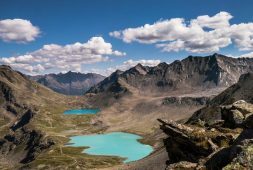 Can’t wait to see all of these gorgeous places and we might be renting a car so great tips! I dream of going to Croatia! Looks like a great trip. I’m so glad you wrote out all the costs. This helps with trip planning and preparation for the future. I dream of going to Croatia with my kids! Looks like a great trip. I’m so glad you wrote out all the costs. This helps with trip planning and preparation for the future. Such a useful blog post. I’ve been to Croatia once a long time ago and I’m wanting to go back, so this is super helpful. It looks so beautiful! I’ll definitely be putting this on my list! Hi there. Awesome in Croatia! I love Kayak and what I’m thinking is Kayak tour prices in the Elaphiti Islands. You inspire me to visit there. I love water sport and everywhere with water field. By the way, I have my own paddle boards which I bought from http://www.pirt.org/best-stand-up-paddle-boards/. Now, I can say I’m very crazy with water destination and water sports. I think I will plan for Kayak tour in next 3 months. Thanks for your sharing.